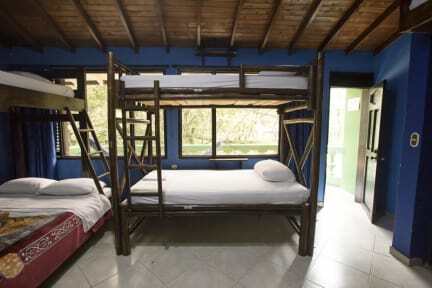 Arcadia Hostel i Medellin, Colombia : Boka nu! Arcadia hostel is located in Poblado Medellin Colombia 5-10 min walk from parque Lleras the 'zona rosa' were you can find the best restaurants, bars and discotheques of the city. We are in front of the stream a lovely green quiet neighborhood away from the noisy streets but close enough to the main action. We are something between a party hostel and a quiet one with very nice public spaces to chill and socialize. An indoor area with nice sofas to watch movies or chill and an outdoor area to socialize, have some beers, eat or play games and chill as well.There are Bingo on thursday night with really good prizes at 7 pm, free salsa lessons every Friday at 8pm were you can learn the basics of salsa and meet locals, and a delicious Greek style BBQ every Sunday around 8pm! There is a big map of Medellin highlighting the best sights that are described in a book we made in English and Spanish.We also provide tours like the Pablo Escobar tour or the Paragliding and our bilingual personal is there to help you whatever you might need! We provide laundry service, 24hrs reception/bar and make your own pancake between 7:30 AM until 10:00 AM with coffee, butter and syrup or brown sugar with fresh fruits as a Free breakfast. There is Free WIFI in all the hostel and 2 computers to use for Free as well!We also provide Free towels by deposit. The showers are nice and have good pressure of hot water always! We have 5 dorms and 3 privates each one has different prices and characteristics that their name from Greek mythology describes quit good! From Hades (converted garage) to Olympus (converted mafia suite) you can choose from really cheap accommodation or upgrade to a better one or choose one of our budget but comfy privates. The beds are very comfy and practical equipped with electricity sockets in each bed, side shelves, lockers and even private lamps in some of them. All in all if you are looking for a cool budget place to relax and chill and meet people all around the world this is your place!! I stayed here for about a week in total. My first impression wasn’t very good, but after a day or two I decided to give it a chance and I’m happy about that. Helpful and welcoming staff, a kitchen that has what it needs more or less, clean bathrooms and a lovely vibe. I would recommend this hostel! We stayed 3 nights after reading all revies of a great atmosphere and great location.. we did not like the atmosphere, all guests seemed to keep to themselfs and nothing fun was going on during our stay. We had a private room next to the kitchen and to be honest it was not that cosy, wifi was so-so. The staff was indeed really friendly and gave great tips for sightseen! It was not the hostel it self that made us feel bored but I guess we had bad luck with the other guests..